The father of noted Arsenal fan and possible future of American soccer Barron Trump, Donald Trump, took a break from caring about a black person tonight and delivered a message about the U.S.’s joint World Cup bid that should be not-at-all off-putting to the voters in the countries it’s meant to address. The North American bid for the 2026 World Cup has only one competitor—Morocco. As Barron’s dad notes, the bid that includes the U.S. is “STRONG” thanks to its clear advantage in already-built stadiums. However, with every FIFA nation receiving an equal vote, Morocco still has a shot at the bid because of its support in Africa and Asia. Also, because everyone hates Donald Trump. According to the U.S. Soccer Development Academy, Barron Trump—who will be 20 years old when he’s ready for his 2026 World Cup debut—currently plays midfield on the D.C. United U-12 squad, and has featured in 17 games so far in the 2017-18 season. He has yet to score a goal. 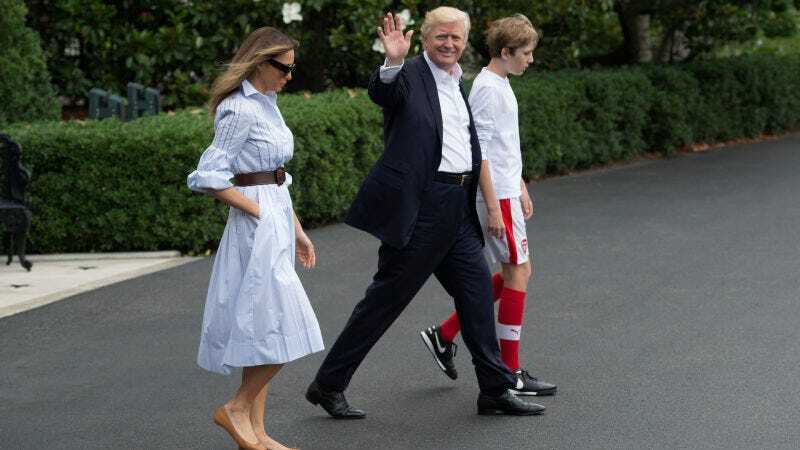 The Future Of American Soccer Might Be Barron Trump?! ?